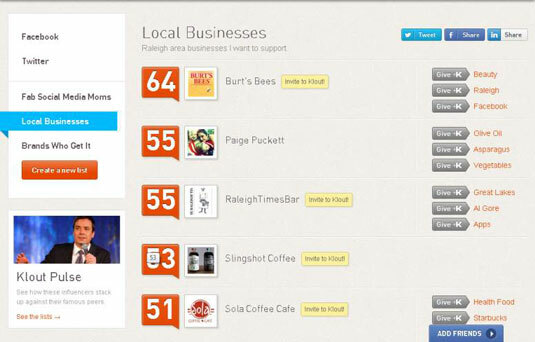 In the sidebar on the left side of your Klout Friends screen, you see an orange Create a New List button. When you click this button, a pop-up window appears. In this box, you can add people to the list and name the list. 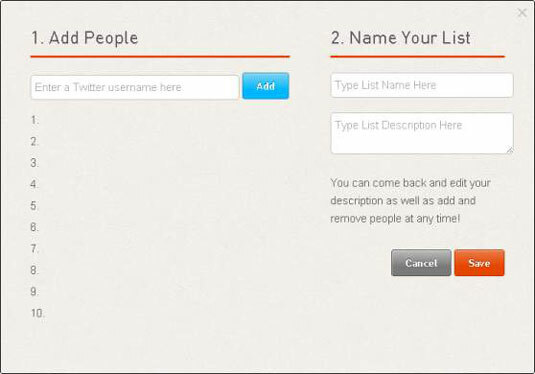 1To add an influencer to your list, type her Twitter name into the provided field and push enter. When you’re typing Twitter names, you don’t need to include the @ symbol. 2Continue adding people to your list. After you’ve finished adding users to your list, create a list name in the provided field on the right side of the pop-up window. 3Click the List Name text box and type the list name. You may add a description if you so desire below your list name. You can also click the Description text box and type a description if you like. 4Click the orange Save button to create your list and close the pop-up window. Your new list appears in the sidebar on the left side of your screen.